Hayley Haining is an immensely talented athlete who has had a career which incorporated more misfortune through accident, injury and interruption than any that I can think of. Add the whole dreadful business surrounding the Beijing Olympic selection fiasco in 2008 and the admiration for her talent pales beside wonder at her sheer determination and courage. Born in Dumfries on 6th March 1972 she won the British Schools Cross-Country international in 1985 at the age of 13 in 1985 and later that year won the SWAAA 800m title for her age group. 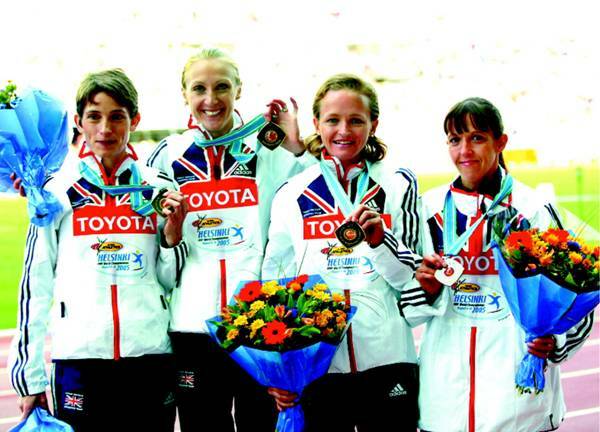 In 2005 – twenty years later – she was running for Britain in the World Marathon Championships in Helsinki and three years after that she was reserve for the Olympics Marathon squad, four runners having done the qualifying time. In the interim she packed a wonderful career as an endurance runner. Just look at the range and quality of her list of personal bests. Her times for 5000m, 5K (Road), 5 Miles (Road), Half-Marathon and Marathon ranked her respectively 33rd, 14th, 20th, 15th and ninth in British all-time rankings, and appears in no fewer than six Scottish all-time lists being third in the marathon. She won the AAA’s 5000m in 1999 and was most unfortunate not to run in the 2008 Olympic Games in Beijing when the selectors gave up on a difficult decision. An 800m in 2:10.96 in the WAAA Championships in Birmingham and a British Under 15 record for 1000m at Tonbridge showed her ability on the wider stage and a readiness to travel. They also showed that she had a supportive background from which to work. Coached from the very start by Jock Redmond from Sanquhar, he remained her coach until her late twenties. In February 1987 she won the Junior Cross Country for the second time and ran in the World 6K Cross-Country Championships where she finished twenty second. When asked in an interview for the website www.runbritain.com “How did it feel to collect your first major medal? How did the race go?” her reply was that her first major medal was the Under 14 girls 800m at the Scottish Schools in 1985. No one expected it, including myself. I only remember going through the bell and feeling that everyone else seemed to be slowing down and thinking “Oh my goodness! I’m at the front!” I just kept running and luckily the line came before I had time to panic. I remember looking into the stand to see my mum and my best friend’s mum jumping up and down on their seats – at 13 I was mortified.” (I can recommend the interview which can be found at www.runbritain.com ) Apparently she had told her Mum at the age of four that she wanted to be a vet. At home in Dumfries she lived near a vet and grew up with animals all around and they have been a major part of her life. However the fondness and proximity to animals almost cost her her running career. At 15, she was helping attend to a pair of young horses at an agricultural show but one of them spooked and pulled her to the ground while the other trampled on her. So severe was the injury that the hamstring was almost torn from one of her legs. Fortunately the jeans that she was wearing helped hold the battered leg together. Her cross-country career had been progressing steadily and when she moved up to the Intermediate (Under 17) age group she finished third just half a minute behind the winner. However after the incident referred to above she missed the next two championships. 1991 started with a victory in the Scottish Senior Cross-Country Championships, 18 seconds ahead of Vicki Vaughan of Pitreavie and Vicki McPherson of Glasgow University. Doug Gillon reported as follows in the ‘Herald’: “The prodigious talent of Hayley Haining, still a young senior under Scottish women’s cross-country rules, not only earned the senior women’s title at Irvine yesterday but also finally brought her justice from Britain’s cross-country selectors. Within minutes, June Ward, secretary of the Scottish Women’s Cross-Country and Road Running Association, was pleading the 18-year-old’s case at the UK World Championship selection meeting, ensuring that the former Nith Valley girl was not once again overlooked for a British vest. Earlier this year, Haining, the UK’s number one junior this winter, was ignored for the Ekiden Relay in Hawaii. “I’m looking forward to racing against the girls who got that trip”, said vet student Haining, who joins Liz McColgan as the only Scots in the world squad. ” In the actual international championships at Antwerp on 24th March, Hayley was seventh to finish: first Britain in a team which finished fourth but fifteenth and 14 seconds back down the field was one who was to figure largely in her future career – Paula Radcliffe. As an Under 20 track athlete in 1991, Hayley had a good season and continued the tendency to travel to good races when she was third at Loughborough on the 23rd June in a 1500m in 4:19.83 and returned a month later to record 4:38.71 to be second in a Mile at the Reebok meeting. On the 20th July that year she recorded 9:12.28 in the World Student Games 3000m at Sheffield. Then she was sixth in the 1500m at the European Students Games at Thessaloniki in Greece in 4:25.26 on 9th August. In the AAA’s Junior championships, she won the 3000m title in 9:31.32. Clearly a successful season by any standards but the best came at the end of the year when this time she did get the Ekiden selection. In an interview for the website www.inthewinningzone.com , she spoke of her first ever GB vest. “An excited description of Hogmanay 1991 indicates that her memories are both cherished and crystal clear. A 19 year old Haining embarked on her first senior athletics adventure having earned her first Great Britain vest as part of a team to compete in an international Ekiden Relay meet in Barcelona. Glancing at the start list she saw a number of experienced names, many of whom had their own chunk of gold to show for their achievements in the sport. ‘I remember seeing names like Wanda Panfil (World marathon record holder at the time) and Yelena Romanova (Olympic gold medallist a year later) and I was thinking, “Oh my goodness!” she laughed. However Haining was not overawed by the experience of the opposition in her leg of the relay, though she admits that she was in a position to race against the best in the world, but her mind did not go blank. Sights and sounds remain embedded in her memory of her first experience of world class athletics. “Every time I went through a kilometre what sounded like a cannon or a rifle would go off. I remember helicopters flying above us throughout the race. The whole thing for me, at 19 years of age, was incredible.” Haining’s first major event was more successful than anyone expected, most of all herself. “It was very, very fast,” she remembers, in fact she was the fastest on her leg of the relay and she crossed the line before any of her competitors. But, she had been plagued throughout her teenage years by pronation of the foot and weak muscles in her lower shins. Whenever she was improving and reaching her targets, injury would strike. At the age of 19, after gaining her first Great Britain Senior vest, Hayley sustained a bone stress fracture that not only took several months to heal but it took her four years to get out of an injury cycle where she would recover, or partially recover, from one injury and gain another injury or accident. While concentrating on her studies to get through Veterinary School in Glasgow, alongside dealing with injury, Haining decided to put athletics on a back-burner for a number of years. She was back in action however in 1996 and on 15th December at Charleroi, having gained selection for the GB team for the European Cross-Country Championships, she finished ninth and led the British women to the silver medals.. On her way back to competition fitness, she had run 10K on the road in33:25 at Solihull in October (placing her third on the ranking list behind Liz and Yvonne) and a half marathon in Glasgow in 77:01 (placing her fifth). In 1997, she ran on the 11th January at Luton in the CAU Inter Counties match and finished fourth in 20:28 running in the colours of Greater Manchester. In the Scottish Championship at Perth on 16th February Hayley Haining won in 23:26 from Fiona Lothian in 26:00. Back in Luton on 2nd March for the BAF Cross Country Championships, she won in 19:15 – five full seconds clear of the second runner. This qualified her for the World Cross-Country 6K race in Turin on 23rd March where she was 22nd, second GB runner behind Paula Radcliffe in second place. In the Scottish Athletics Yearbook for 1998 (1997 results) we see her ranked fifth in the 10000m on the road with a time of 34:20 at Barnsley in November but not anywhere else. 1998 started with the World Cross Championships at Marrakech in March where in the 8K race she was thirteenth – not having run in the Scottish Championships in February – and again second Briton behind Paula Radcliffe in second. There were no other races on the country listed in the Annual Yearbook either for the start or the end of the year. On the roads however she is credited with a 5K in 15:49 in Edinburgh on 14th March which topped the rankings with Karen MacLeod second with 16:58 – more than a minute behind. That was the sole mark recorded. In 1999 Hayley Haining did not appear in any of the early season cross country fixtures missing the National and the World Championships. There was a surprise for her admirers during the summer season however – Hayley Haining returned to the track. The ‘Yearbook’ said above the 1500m rankings, “27-year-old Glasgow vet, Hayley Haining, who had never bettered 4:20 for the metric mile, twice set times under 4:16 with a best of 4:14.78 to take ninth position on the all-time lists, the first to enter the top ten since 1991. Two of her fastest three runs were achieved in mixed races at the valuable, athlete-friendly Grangemouth open graded meetings in her first track races since 1996 due to persistent injuries.” Her times ranked her first (4:14.78), second 4:15.85) and tenth (4:23.7). There was more – comments on the 3000m rankings were as follows: Hayley Haining became the thirteenth fastest Scot over the distance when recording 9:14.0 in a Two Mile race at Loughborough with another back-up run just fractionally slower over 11 seconds ahead of second ranked Katie Skorupska. ” The times in question were 9:14.0 at Loughborough on 23rd May and 9:14.05 at Solihull on 14th July. Comments on the 5000m performances read “Hayley Haining, second ranked in the UK Merit rankings behind Paula Radcliffe, and Katie Skorupska both bettered 16 minutes for the first time to rank fourth and fifth all-time … Having confirmed her excellent form at all events from 1500m upwards when recording her fastest time in an international grand prix race at Crystal Palace, Haining had her best competitive moment on the track when winning the AAA Championships at Birmingham.” The fast times were 15:46.05 at London on 7th August, 15:48.98 at Ashford in Kent on 28th August and 15:56.59 when winning the AAA’s at Birmingham on 24th July. It should be noted that two of the above times – 9:14.05 at Solihull and 4:14.78 at Scotstoun were run in BMC Nike Grand Prix races: Hayley was a supporter of these races which have helped so many athletes. She had not however abandoned the road running scene and topped the ratings for the 5000m with a time of 16:23 at Bath on 28th March and for the 10K with 33:48 at Bedford on 25th April. At the end of the year there were several good cross-country performances, On 21st November in the Margate International she ran into fourth place in 18:25 in a close race – only eight seconds between first and fourth! The European Championships were held in Slovenia on 12th December and she finished eighteenth. 1999 had been a good year for Hayley Haining. Hayley began 2000 with fourth place in the Reebok CAU Inter-Counties and followed up with a victory in the Scottish Cross-Country Championships leading the City of Glasgow team to gold. After which she was fourth in the UK Cross-Country Championships 8K race which earned selection for the World Cross-Country. Held on 18th March at Vilamoura in Portugal, over the same distance, she was 56th. 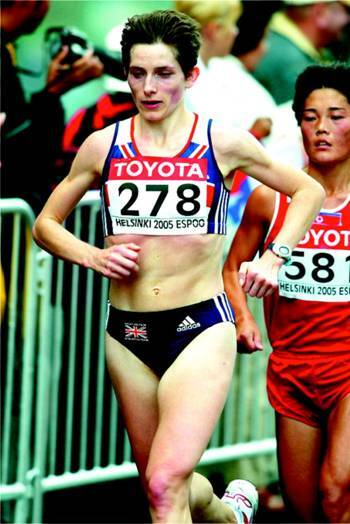 The Statistical Annual Yearbook commented at the top of the 1500m lists that ‘an out-of-sorts Hayley Haining was almost 11 seconds slower than her 1999 best.’ Her time was 4:25.6 run at Grangemouth on 2nd August. There was no Hayley in the 3000m at all and in the 5000m she had a time of 16:29.8 which ranked her third Scot, although it was good enough to win her the Scottish 5000m championship at Scotstoun in July. Top of the rankings on the road 5 Miles with 26:29 at Balmoral in April, she was second in the 10K behind Lynne MacDougall with 33:38 – 16 seconds down. The only road victory was in the Capital City 10K in Edinburgh in September where the time was 35:06. At the very end of the year, Hayley ran in the Reebok Challenge at Cumbernauld on 16th December and finished third leading the West of Scotland to a team victory. Nevertheless in 2001 she was again top Scot in both 5000m and 10000m on the roads with 16:53 at Glasgow in April and 33:40, also in Glasgow, in May. In an interview with ‘The Scotsman’ in August, Hayley is quoted as saying, “I wasn’t injured when I stopped running four years ago but I was having to do a lot of rehab work at home every day just to be able to run. Plus my work was so time consuming so the most sensible thing to do was to chill out for a while. It was difficult to break the habit of a lifetime so I was still going out and doing some jogging and looking after my ankles and feet. It wasn’t like I sat on my backside for four years,” she joked. Spring 2004, with her PhD completed, the brightening weather encouraged her back out running more often although an international return was the last think on her mind. She started training with the Kilbarchan club and running a half marathon in Glasgow and a 10K in Dumfries. And then the marathon appeared on the horizon” True to her word, there were no competitive sightings of Hayley Haining in either 2002 or 2003. The ability had not gone away and the break might have done her good. She opened 2004 with 75:35 in the local Kirkcudbright Half-Marathon on 29th May. It was her first victory in an excellent season. On 8th August she was slightly slower when she did 79:45 in the Barr-Brady Helensburgh Half Marathon which was another win. The Fresh ‘n’ Lo Great Scottish Run was on 22nd August and she was timed at 77:21. Then on 1st September it was 35:08 in another local race, the Gallovidian-Dumfries 10K where she was again first. After the half marathons and 10K, she did the in-between distance of 10 miles on 20th November in 56:27 in the Brampton – Carlisle, before ending the year on 5th December with 34:47 to win the Stranraer 10K. It had been her first proper season on the roads and it had gone well. Still, the jump up to the full marathon distance is never easy and many top runners never make it. At the end of that summer she was ranked sixth in the 10K, top in the 10 miles and fourth in the half marathon and with at least four first places behind her. But Hayley ran not one marathon, but two in 2005. Her first notable event was on 23rd January when she was timed at 73:31 for the Brass Monkey Half Marathon in York – an event that she would run again. On 20th March she ran the identical time of 73:31 in the Wilkinson Ackworth Half Marathon in the North East of England. Then it was the big one – on 17 April the marathon career started for the woman who had started out running fast 800m races as a twelve year old. In the Flora London Marathon she clocked an outstanding 2:35:23. Established marathon runners now sat up and took serious notice. The good running continued: On 9 June she ran 33:18 in the Polaroid 10K in Dumbarton and on 26th June her time of 75:32 won the Diet Coke Half Marathon in East Kilbride. Her next marathon came up on 14th August when she raced to a pb of 2:34:41 Helsinki in a team than, led by Paula Radford was third so that she came home with a medal. On 2nd October she competed in the World Half Marathon Championship in Edmonton, Canada, and finished 24th in 73:39.. She returned to the Brampton to Carlisle 10 Miles on 19th November and ran 54:50, before ending the year on 4th December with 34:06 in the Hugh Wilson Memorial 10K at East Kilbride. It had been an excellent year with two successful marathons completed and the world half-marathon run in Canada. At the end of the year she was second in four events on the road – first Scot in the eyes of many: in the 10K she was second to Kathy Butler with 33:18 run in Dumbarton to Butler’s 32:24 run in Atlanta; second in the 10 Miles with 54:50 to Butler’s 54:34 run in Philadelphia; second in the Half-Marathon with 72:34 to her rival’s 71:53 also run in Philadelphia; and second in the Marathon with her 2:34:41 run in Helsinki second to Butler’s Chicago run of 2:30:01. Next year was now the one to look forward to. The big event for almost all sporting Scots was the Commonwealth Games in Melbourne. With the qualifying time achieved in 2005, she was at the start line in Melbourne, Australia on 19th March. Another good run saw her finish ninth in 2:39:39, one place and 20 seconds ahead of Scottish rival Susan Partridge. Clear of injuries, she won the Jim Dingwall Memorial Round the Houses 10K in Grangemouth in 33:26 on 23rd April and two weeks later ran a 34:11 in the BUPA Great Edinburgh run. Two weeks after that (21st May) it was the Scottish Half Marathon Championships, Dunfermline in 74:19. She seemed to like East Kilbride and on 25th June she won the Diet Coke half marathon in 72:27. At the end of August (28th) in the Paisley Vision 10K 34:30 was the time when winning this one too. In September she ran 33:26 in the City of Stirling 10K and her time of 71:41 was recorded in the Great North Run. Her second marathon of the year was the Adidas Dublin Marathon where 2:31:51 was another personal best. It was a genuine international field and it is worth recording the top five finishers: 1. A Ivanova (Russia) 2:29:49; 2. H Haining 2:31:51; 3. L Zyusko (Russia) 2:33:09; 4. L Cheptumi (Kenya) 2:33:34; 5. J Vinoukorova (Russia) 2:33:43. At the year’s end Hayley had two first places in the rankings and three seconds – all to Kathy Butler who did the times in Philadelphia and Chicago again. Hayley was top in the 5 Miles (27:15), second in the 10K (32:26), top in the 10 miles (54:21), second in both half-marathon (71:41) and marathon (2:31:41). She must have gone into 2007 in good heart and started the year on 21 January with a time of 72:06 Brass Monkey Half Marathon, York 1st. In the ‘Let’s Run’ interview she replied to a question about what has been her favourite race with, “I have done the Brass Monkey half marathon several times now. It is a flat, fast course (if a little exposed! ), well organised with a great atmosphere.” Hayley went on to win the Grangemouth Round the Houses race 10K on 15th April in 32:59 and then on 26 May ran 72:24 in the Kirkcudbright Academy Half Marathon where she was first. On the 30 June 32:47.96 BMC Nike GP Watford she was 2nd in 32:47.95 (5000 16:14.9) and on 5th August it was 33:14 in the Scottish Gas City if Edinburgh 10K. On 19 August she ran 32:59 Birchwood 10K, and on 2nd September she was timed in at 71:18 in the Fresh ‘n ‘Lo Great Scottish Run Half Marathon. The times were coming fast with every race so it was no real surprise to see another personal best in the Real Berlin Marathon on 30th September of 2:30:43. She was sixth. In November, it was back to the Brampton race where she won in 54:31. 2008 was Olympic year and given the times being recorded by Hayley, she must have had a real chance of making the team. No one realised how close it was going to be! She started the year with the, by now customary, Brass Monkey Half Marathon and ran the fast time of 71:46. That was in January and the next fast run was the Asics/Sweatshop Reading Half Marathon where she was even faster with 71:03. These set her up for the Flora London Marathon to be run on 13th April: it turned out to be another personal best and Olympic Qualifying time of 2:29:18, having gone through the half marathon in 73:56.. It was the official qualifying race and she was third Briton when she finished behind Liz Yelling and had the time. BUT – and it was a very big but – Paula Radford had not run because she was injured and the selectors had to have her in mind. There were four with the qualifying time but only three places: Yelling and Mara Yamauchi would both be going to the Games but Radcliffie would go only if she were fit enough. If that were not the case, then Haining would join the other two. The two had been rivals as Juniors with Haining being regarded as the more outstanding prospect of the two but injury after injury had taken their toll and Radcliffe had gone on to win the medals and make a fortune while the Scot had been happy just to run. Nevertheless when the selectors abandoned their responsibility and decided that they would leave it up to Paula to decide whether she would run or not it was clear that Hayley’s chance had gone. No athlete would turn down the chance of running in the Olympics, no matter how many medals they had or how many Games they had competed in. But Paula refused to say whether she would run or not until the very, very last minute. An article in ‘The Scotsman’ of 22nd July, 2008, contained the following section. “It remains unclear whether Hayley Haining will be going for gold this year at Beijing but whether she runs or not, the 37-year-old has already displayed the composure, drive and mental strength common to all Olympians. However else is an athlete meant to prepare physically and mentally for sport’s greatest event when all the while they must wrestle with the knowledge that such a golden opportunity could be denied at the last moment? It is fate both enviable and tortuous but one that Haining has come to terms with in recent months. As the official reserve for Paula Radcliffe, the world marathon record holder and leading lady of British athletics Haining is on standby. Should Radcliffe – diagnosed with a stress fracture in her left femur in May – fail to recover from injury, then her place will be taken by the Scot. Radcliffe last week underwent a medical examination in Middlesex. The only result was to further ambiguity. Now back in her base in the French Pyrenees, the former BBC Sports Personality of the Year says she is fighting her own “race against against time ” . Given her pedigree UK Athletics are postponing any decision until the last possible moment. The call, it has been suggested, may not be made until the eve of the race.” As it turned out, Paula chose to run and after finishing twenty third said that there had been no long runs in training and a lot of the running had been indoors and the whole thing seemed strange to the ear of the bystander. And for the rankings? Hayley topped the lists for the 10K with a time of 32:24 run in Cardiff (second was Kathy Butler with 33:43 run in Cape Elisabeth, USA), for the half marathon with 70:53 in the Great North Run (second was Kathy Butler in 74:52 run in San Jose, USA) and the marathon with 2:29:18 (second was domestic rival Susan Partridge with 2:41:40. Nevetheless, Hayley worked throughout the summer with a whole series of brilliant performances: 26th May: BUPA London 10K – 33:56; 1st July: Scottish Athletics 10K 32:57.91; 27th July: BUPA Great Wales Run – 32:24; 7th September: Fresh ‘n’ Lo Great Scottish Run – 71:28; 5th October: BUPA Great North Run – 70:53. The year ended with th the New York City Marathon in 2:35:11, half marathon split of 75:23. By any reasonable criterion she should have been at the Games and she was badly treated, but she did not complain, she never criticised either Radcliffe or the selectors although she must have been however slightly irked, and it was a good season. 2009 was a bit of an anti-climax but the good running continued. On 10th May Hayley ran 33:31 in the City of Glasgow Women’s 10K and a month later 34:12 in the BUPA Great North Run 10K at Sunderland. Two good races in August were both 10K’s – 34:29 on 2nd August in the Scottish 10K in Edinburgh and 34:08 in the Paisley Vision race on 30th August. There was only the one marathon in 2009 and that was in Berlin where she recorded 2:36:08 and, as is the custom now, the half-marathon time was given – 74:31. There is the tale that I heard from a friend and fellow-competitor of the European Cross-Country Championships in Edinburgh in 2002 when several athletes were assigned to the visiting nations as hosts. Hayley was allocated the Ukraine team and when Sergey Lebid won his race, he insisted that Hayley accompany him to the bar. Her Mum had to come to drive her car home! Having a good job at Glasgow University and having given birth to a son in August 2010, she could be excused for stopping running and racing after having been in the sport since the early 1980’s but Hayley said that it is like a bug or an infection and she is still racing – maybe not as frequently but still appearing on race start lines. In 2011 she ran 78:46 in the Bank of Scotland Half-Marathon in Glasgow and 2:35:10 in the New York City Marathon. ‘If only …’ are words heard too often (and usually inappropriately) in sport, but in Hayley Haining’s case I’ll take the risk of asking – “What if her career had been minus all the stop/starts?